The area has much to offer to visitors who seek beautiful countryside, a slower pace of life and relatively quiet roads. Mentioned in the Domesday book, present day Dilwyn is the result of more than a 1,000 years of settlement. Because of this, Dilwyn has many historic buildings and interesting features. The central village itself is designated as a conservation area. However, Dilwyn civil parish includes much more than the central village. 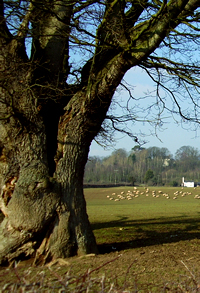 Within the 6400 acres of the parish are the hamlets of Sollers Dilwyn, Little Dilwyn, The Haven, Hill Top, The Hurst, Headland, Bearton, Bidney, Henwood, Stockmoor and Stockingfield amongst others. The 2011 census lists 300 dwellings and a population of 711 for the whole parish. Dilwyn is an ideal starting point for touring the local trail of black and white villages. Time spent by visitors looking at the church of St Mary, examining the pretty local buildings and cottages, strolling on the green and perhaps visiting the pub and its garden or taking tea at the Old Forge will give a taste of the desirable quality of life enjoyed by this community. The Notice Boards on the village green have information for visitors on the reverse sides. to keep up to date with the latest news and information.